Tattoos aren't a new fad. According to the Pew Research Center, 36 percent of Americans from 18 to 25 have at least one tattoo. However, a new trend that is popping up in the tattoo world are medical alert tattoos. These can range from letting someone know you have diabetes to do not resuscitate directives. There are, however, a few things that you need to keep in mind if you choose to get this type of tattoo. You've probably seen someone on the street wearing that familiar red or metal band on their wrist with the Caduceus symbol. You might not know what he or she is allergic to or what disease the person has, but you can recognize a medical alert bracelet. This bracelet has been a staple for people with medical conditions for years. But there is a new trend taking place among the young and old alike: medical alert tattoos. These tattoos come in all shapes and sizes and can be found all over the body. Some are simple and others are elaborate, but they all serve a purpose: to alert medical professionals of a condition. These tattoos are taking the place of medical bracelets for people that can't or just don't want to wear them. Medical alert tattoos can be designed and created for any disease, allergy, or medical directive. But there are a few common ones that are linked to severe diseases or allergies that are becoming more prevalent since taking the wrong action can in some cases lead to death. 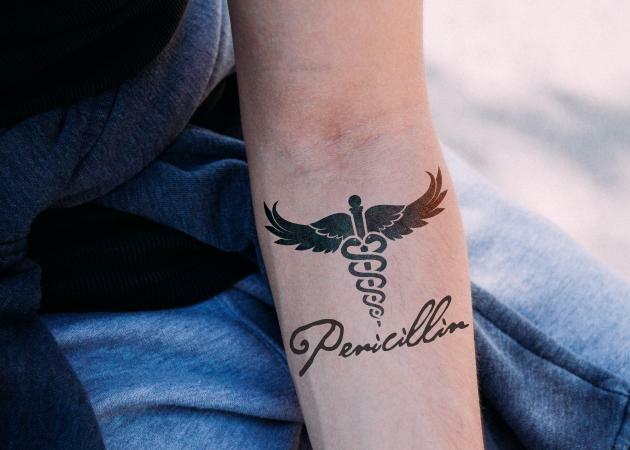 A common medical alert tattoo cropping up are those that warn of allergies to medication like penicillin or foods like peanut butter, like the one shown above. If you have allergies, they can lead to anaphylactic shock if you ingest an allergen or are given a medication you are allergic to, so awareness is vitally important. It's especially important for medical personal to be aware of medication allergies if you are unconscious. The most common design for an allergy medical alert tat is the Caduceus with wording stating the allergy. However, you might see some that create an intricate design around the words or take on the appearance of a medical alert bracelet. The med tats for allergies are as varied as the individuals that get them, but most do use the Caduceus since it will alert medical professionals immediately. If you are a diabetic or know a diabetic, you know how low and high blood sugar can affect a person. In an emergency situation, certain medications can also affect the person's blood sugar, so it is important for a paramedic or doctor to know immediately that they are stricken with this disease. For example, if a person is showing confusion, dizziness, or slurred speech, the first thing a responder can do is check his or her blood sugar to ensure that the person's levels aren't too low. 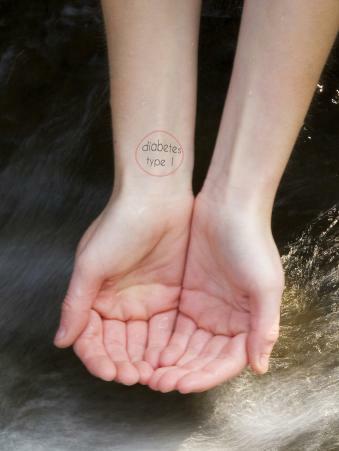 There are a few designs that you might see for a diabetic medical alert. The alert typically mentions the person is a diabetic and what type he or she has (1 or 2). It might also incorporate a blue circle which is a symbol for the disease. You might see a Caduceus symbol with a circle behind it. Yet others include the staff of Asclepius, asterisk and hexagon of the typical medical alert symbol. There are multiple different variations and color schemes that people might choose as well, depending on their personal preferences. Another important medical alert that you might find tatted on the skin is a design alluding to a heart disorder. These types of tattoos might alert you of a heart implant like a pacemaker or defibrillator. They can also warn others about a heart condition like atrial fibrillation. These designs might include the Caduceus or staff of Asclepius, but they usually have original elements like a symbol for a defibrillator. Some might also include a stethoscope or other aspect that point to the heart. Some designs even include jumper cables. While asthma is typically treatable, if you are unconscious or unable to speak, it can quickly become a medical emergency. If you are asthmatic, you need some way to inform medical professionals or helping hands. Like most medical alert tats, asthma alerts can take on several forms. You might see this design with a simple staff of Asclepius with the word asthma or asthmatic woven through. You can also get decorative and add a banner and other details like an inhaler. 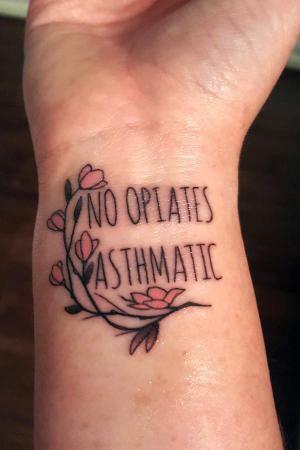 You can even combine this tat with other images, like pointing out not to give opiates with a decorative poppy. Another common condition that requires a medical alert is epilepsy. 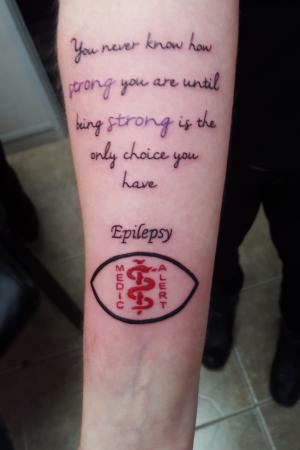 The form that you can take with your epileptic med tat can range from a purple ribbon and butterfly associated with the condition to medical symbols. Regardless of the symbol used, the words epilepsy or epileptic are always included with other instructions as needed. Placement of this type of tattoo is important. While you might see it on the leg, shoulder, back, or any place really, it won't serve its purpose unless it is visible. Since this type of medical alert is fairly new and doesn't have any regulations, most medical responders will not be looking for it. This is why this tattoo type is commonly found on the wrist, forearm, or chest. These are common places that an EMT or doctor will see right away. Additionally, you will want to make it readable. 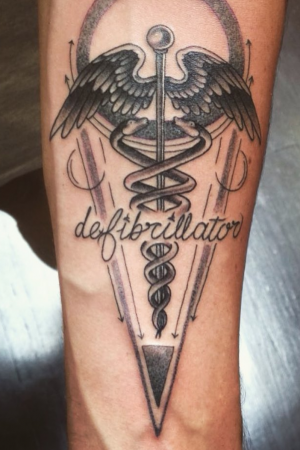 Having a medical alert tattoo that you can't read doesn't help a paramedic in an emergency. If you want a medical alert tat, it's best to make it larger and put it in a visible area. Every tattoo that you get is a choice. But for medical alert tattoos, it's very important to think about the ink you are getting. There are several positive aspects to this tattoo, such as its permanence and the fact that it can't get lost. It can also be a great alternative for people that are allergic to metals or have an issue with wearing a bracelet. However, there are some downsides that medical experts say you must consider. There isn't a database of medical tattoos. So if you do opt for a medical alert tattoo, it is suggested that you still carry your alert card in your wallet or purse. This can help to validate your tattoo and allow responders to see any changes in your condition over time. The lack of regulations can make the alert difficult to distinguish. To make sure that your tattoo serves the purpose of a medical alert, you will want it to be clear that it is a medical alert. It won't do you any good if the Caduceus gets lost among other elements of your design. It isn't something that responders look for. To negate this, you can put the alert on your wrist or forearm in a clear and visible place for responders. For example, on the wrist they will see the tattoo when checking your pulse. Tattoos come with risks. If you are already allergic to specific substances, then you can have an increased risk getting a tattoo. Unlike a medical alert bracelet, you can't take a tattoo off. This means that you will be informing all your future employers that you have a medical condition. According to Michelle Yager-French, owner of Carmel Tattoo INK, having a visible wrist tattoo can also affect where a person can and can't work. Young people, then, should be especially careful in considering this type of tattoo since it could affect future job prospects. Medical tattoos are becoming more and more common in society. While there aren't any specific studies, a look at the Diabetes Advocacy website can show you how the prevalence has increased. If you have a severe allergy or a disease like diabetes, this can be a helpful tattoo since you can't lose your arm or misplace your wrist. However, professionals do point out that these tattoos aren't regulated and might be overlooked by medical professionals. You can negate some of the risks by getting a visible simple design. After weighing the pros and cons, if you decide this tat is for you, remember it is important to have your medical alert card in addition to your tattoo.